Visitors and browsers welcome – we don’t care if you buy; just come and enjoy the smell, and marvel at the stories of this remarkable and unique Tasmanian industry. Large slabs of beautiful, glowing, figured Huon pine. A ‘lucky dip’ offcuts bin with most pieces priced at $0.50c. Blanks and squares, dry and ready for immediate wood turning, in Huon pine, King Billy pine and, occasionally, blackwood, myrtle and celery-top pine. Huon pine boards cut into small and medium sizes – perfect for kitchen chopping boards – priced from as little as $5.00. Racks of seasoned and sawn Huon pine and King Billy pine in a variety of sizes and lengths. Coffee table sized slabs of Huon pine. Photographs, maps, videos and information on the trees and timber and the careful processes used to salvage and husband this precious resource. 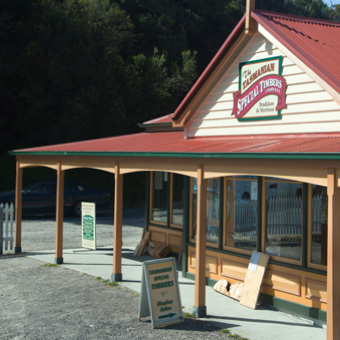 You can find all of these things in our shop on the Strahan waterfront, at the ‘carpark end’ of the Wilderness Woodworks building (just past the Visitor’s Centre).